An intense pace of top-level meetings in recent months has sought to reduce Sino-Indian and Sino-Japanese tensions. 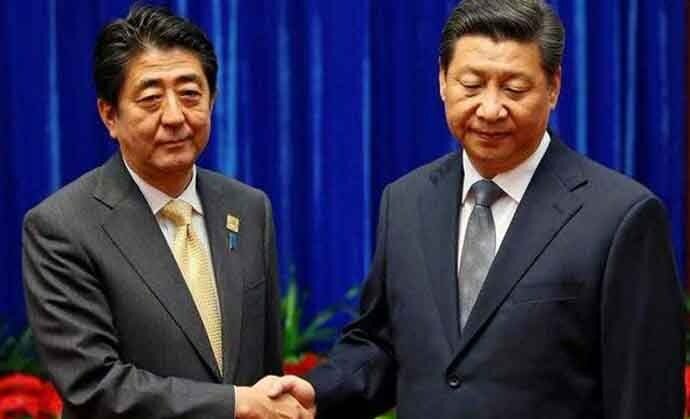 The Beijing summit between Japanese Prime Minister Shinzo Abe and Chinese President Xi Jinping on Friday (October 26) follows Indian Prime Minister Narendra Modi’s April 27-28 “informal” summit with Xi in Wuhan, China. The Wuhan summit, in turn, was followed by Chinese Premier Li Keqiang’s Japan visit. More recently, Chinese Defence Minister Wei Fenghe visited India. Despite the flurry of visits, Japan-China ties and India-China relations are unlikely to easily return to normal. In fact, the current spotlight on the Abe-Xi summit cannot obscure the more substantive discussions starting Sunday between the Japanese PM and Modi in Tokyo. The Abe-Modi summit promises to cement the Japan-India relationship as Asia’s fastest growing — and open the path to a military logistics pact to allow access to each other’s bases. The entente between Asia’s richest democracy and its largest is a central pillar of the “free and open Indo-Pacific” strategy that US President Donald Trump’s administration is assertively pushing. Indeed, Abe is the architect of the “free and open Indo-Pacific” concept, which he formally unveiled more than two years ago. 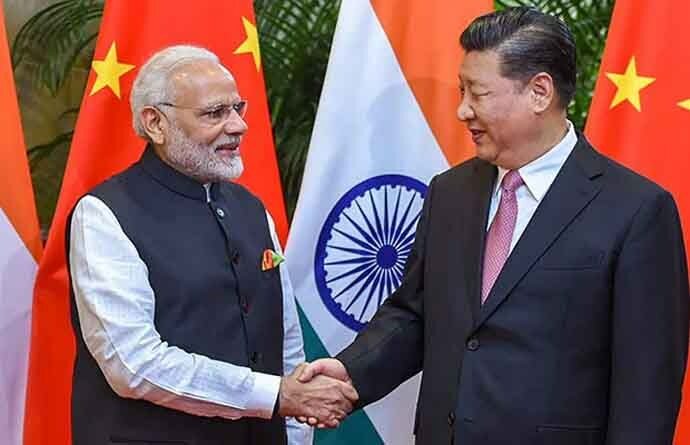 Modi’s government, for its part, was the global leader in denouncing Xi’s signature Belt and Road Initiative (BRI) as opaque, predatory and neo-colonial — a description that has now gained wide international currency. Today, Japan and India serve as the linchpins for establishing an Indo-Pacific order based on the principles of the rule of law, free trade, freedom of navigation and peaceful resolution of disputes. The Trump administration openly acknowledges the critical importance of the Japan-India relationship to achieving a “free and open” Indo-Pacific. After all, China, Japan and India constitute Asia’s strategic triangle. They form a scalene triangle — three unequal sides with China representing the longest side, Side A, Japan-Side B and India-Side C.
In this triangle, if B and C gang up, A cannot hope to gain pre-eminence in Asia. Trump’s Indo-Pacific strategy is really the successor to the “pivot” to Asia, announced by former US President Barack Obama’s administration in 2011, which became subsequently known as the “rebalance” to Asia. Like the “pivot,” the Indo-Pacific strategy is founded on the realisation that the United States needs to correct its disproportionate focus on the Middle East by reorienting its policy to reflect Asia’s central importance to long-term American interests. Asian security competition is occurring largely in the maritime context, which explains the increasing use of the term “Indo-Pacific” — representing the fusion of two oceans, the Indian and the Pacific. Geo-economic competition is also gaining traction in this region, which boasts the world’s fastest-growing economies, the fastest-increasing military expenditures and naval capabilities, the fiercest competition over natural resources, and the most dangerous hotspots. The Indo-Pacific, thus, holds the key to global security and a new world order. The broadening of America’s “pivot” to a wider region that includes the Indian Ocean is a riposte to China’s BRI, whose largest investments in infrastructure projects are concentrated in the Indian Ocean Rim. And as China’s first overseas naval base at Djibouti and its acquisition of several unpopulated islets in the Maldives illustrate, the Indian Ocean is also becoming Beijing’s geostrategic focus after its success in creating and militarising artificial islands in the South China Sea. Against this background, Abe and Modi, besides signing an accord on Monday to build maritime domain awareness through partnership, will set in motion the process for the Japanese and Indian militaries to clinch a logistics-sharing agreement — formally known as the Acquisition and Cross Servicing Agreement (ACSA). A logistics-sharing accord has become imperative for the two militaries, given the number of joint manoeuvres they hold, including three-way exercises involving the US Navy in the Indian Ocean and the Pacific. An ACSA with India will help Japan project its rising naval power in the Indian Ocean, including allowing Japanese ships to get fuel and servicing at Indian naval bases. With the loosening of the legal and constitutional constraints on the military under Abe, the Japanese navy, instead of focusing merely on territorial defence of the homeland, is now able to operate far beyond the Japanese shores. 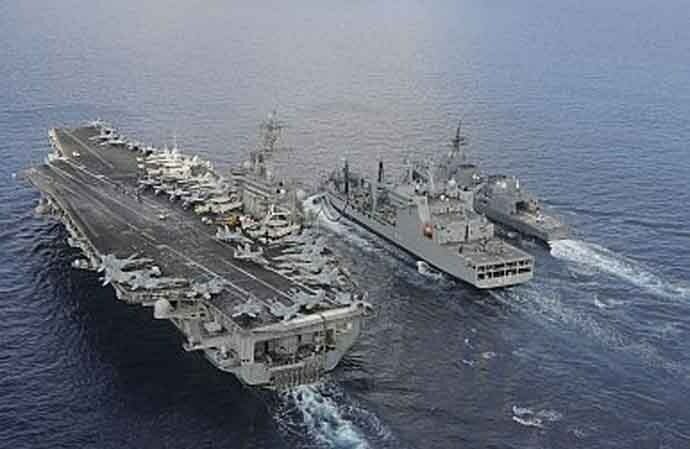 India has signed military logistics pacts with the US and France. A logistics-sharing agreement with Japan, along with greater bilateral maritime cooperation, will help the Indian navy expand its footprint to the western Pacific. 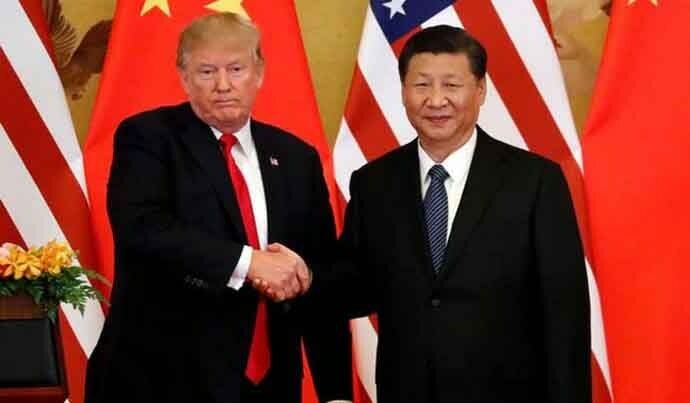 Things can get awkward: US President Donald Trump and Xi Jinping at the Great Hall of the People in Beijing. (Credit: Reuters file). The plain fact is that Japan and India, in the absence of any historical baggage, are natural allies that share largely complementary interests. In fact, Japan has the distinction of being the only country that has been allowed to undertake infrastructure and other projects in India’s sensitive Northeast and the Andaman and Nicobar islands. If Japan and India add concrete security content to their relationship, their strategic partnership could potentially be a game-changer in Asia. Abe’s summit with Xi — and Modi’s earlier summit with the Chinese leader — cannot hide the fact that Japan and India face a serious challenge from a revisionist and muscular China. In fact, it is the Trump administration’s pressure on Beijing on trade, technology and other fronts that has prompted Xi to reach out to Abe and Modi. 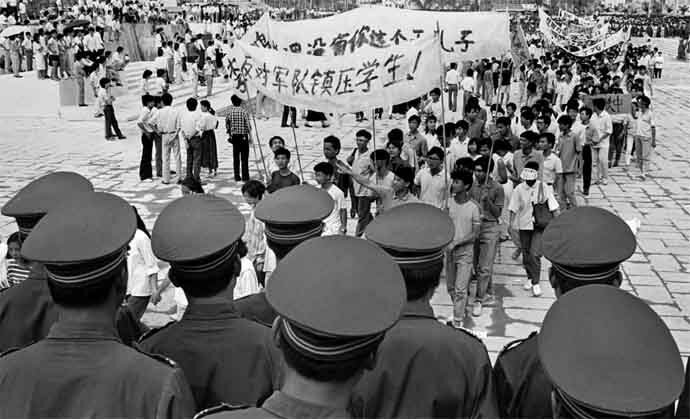 Xi is probably hoping that Japan, like it did after the 1989 Tiananmen Square massacre of student-led protesters, would help bail out his country at a time when America’s China policy is undergoing a fundamental shift. Japan was one of the first countries to lift the post-Tiananmen economic sanctions, an action that paved the way for Emperor Akihito’s 1992 historic visit to China. But Japan, like the US, has now shed its China blinkers and embraced a more realistic, clear-eyed approach to relations with Beijing. India, too, is under no illusion that a Xi-led China is going to discard its bullying and rule-breaking and become a good neighbour. In this light, the Abe-Modi summit will reinforce the strategic alliance between their countries. The New Delhi-Tokyo duet can make a meaningful contribution to building strategic equilibrium, power stability and maritime security in Asia and the wider Indo-Pacific.